I rarely link products in this forum unless I find them to be outstanding and the devloper congratulated on a job well done. Paul Wheelers freeware tropical island packages are on that list!.. however I would like to direct your attention to another awesome freeware package. As many of you who fly in Asia most likely already know the landclass there is very poor and Aces made a lot of mistakes in file calls for the region. Even the 3rd party landclass products, although help, do not bring Japan 'ALIVE' like this freeware. I came across this little GEM and want to bring it to everyones attention! It is a freeware landclass for the entire country of Japan which includes ROAD data as well as corrected shorelines, etc. It is very much like a mini "UTX Japan" I have tested this freeware landclass extensively with our GEX ASA and GEP3D products and with the exception of a few 'minor' issues, it is the BEST render of Japan in FSX I have ever seen. NOTE; RECENTLY THE FILES BECAME UNAVAILABLE AND THE WEB PAGE LINKS POSTED ABOVE ARE NOW DEAD. IN ORDER TO MAINTAIN THE CREDIT FOR THE SOURCE I AM LEAVING THE INFORMATION ABOVE HOWEVER I AM PROVIDING A DIRECT LINK TO THE FILES BELOW. 1. Download the Japan landclass file named: Haruo's_Japan_Landclass.zip to your desktop and unzip it. 5. Launch FSX/FSXSE or Prepar3D. 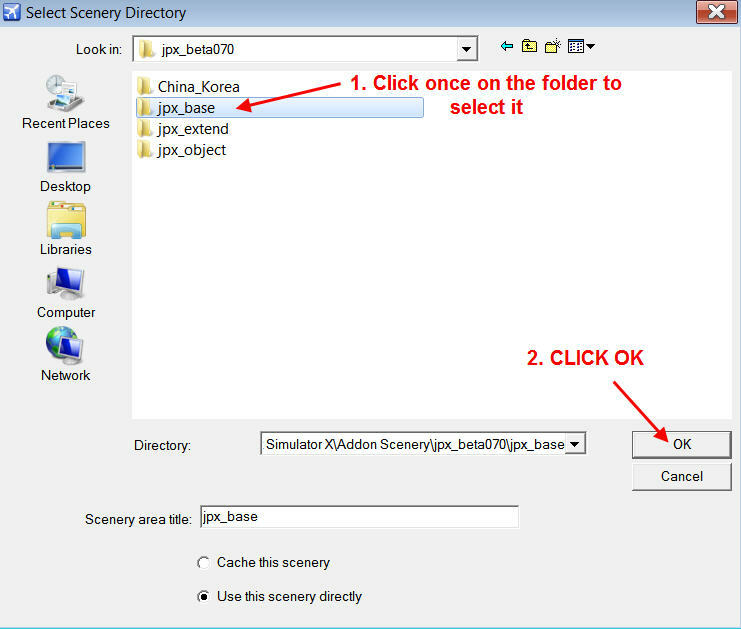 Go to the Scenery Library and click ADD AREA. Browse to and open the Addon Scenery\Haruo Japan Landclass directory. Browse and open the first directory, click OK, Repeat until all 3 directories appear in your scenery library list. NOTE: In FSX and Windows 7 there is a bug where you must place the mouse pointer anywhere in the white box and click once to accept the selection, this is a Windows 7 bug and the FSX scenery library will accept your selection after doing so..
6. IF YOU USE any 3rd party landclass such as SceneryTech or Xclass Asia, BE SURE it is located anywhere BELOW the 3 entries shown above. You can enable them and they can be layered anywhere, just make sure they are UNDER the entries as displayed. 8: Launch your Japan flight. ONE LAST NOTE: Tokyo in default FSX has always been hard on frames due to the airport and the complex FSX custom city models used there. This landclass will increase the system load in the city of Tokyo since it will call many high-count autogen tiles. Users on slower systems may need to trim the autogen slider in Tokyo somewhat. I found no other location in Japan that imposed any load issues. ENJOY this wonderful landclass for Japan with GEX Asia and South America and Ground Environment Prepar3D World Edition. Mr Haruo, Thank you for your work! 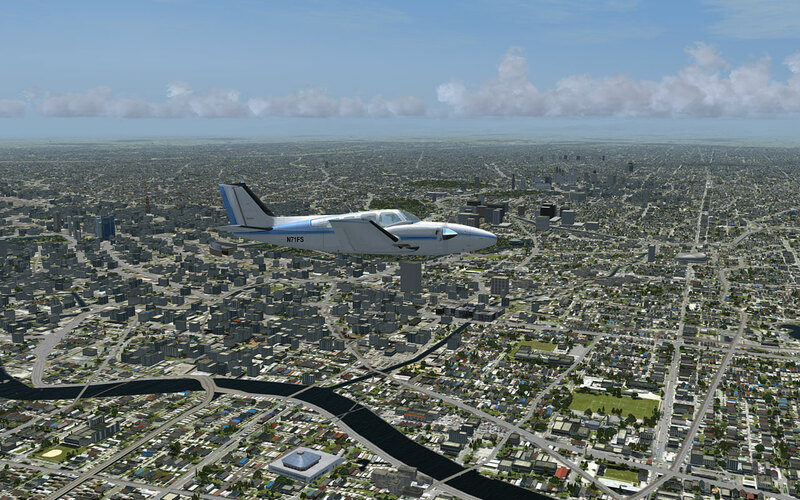 It is quite stunning and everyone should know about your talent and this generous freeware offer to the Flightsim community. You can not use the GEX altered additional files or it will screw up your render with mismatched files. Thanks Nick for the heads up, really looks great with ASA. "Paul Wheelers freeware tropical island packages"
Never mind, I found it through Google. to the Scenic library, I get a blank line entry for each one, in priority slots 1,2, and 3. It seems they have been added, but no name appears in the list after adding. When you select the folder then put the mouse in the white box area and click it.. it will accept the scenery selection. It's probably the Win7 bug. I just tried to add them again, but it says each one already exists, although as I said, there is no "name" in the 3 library listings, just three enabled no name slots 1-3. I checked flying out of Narita RJAA and headed SW towards Tokyo. I see blue roofs, square symetrical odffices/apts with many regular rows of windows and a huge round stadium. That's strange! No name? I have never heard of that! You are saying you see 3 blank lines at the top of the scenery library? Are you sure you followed the directions and compiled the folders as I outlined? 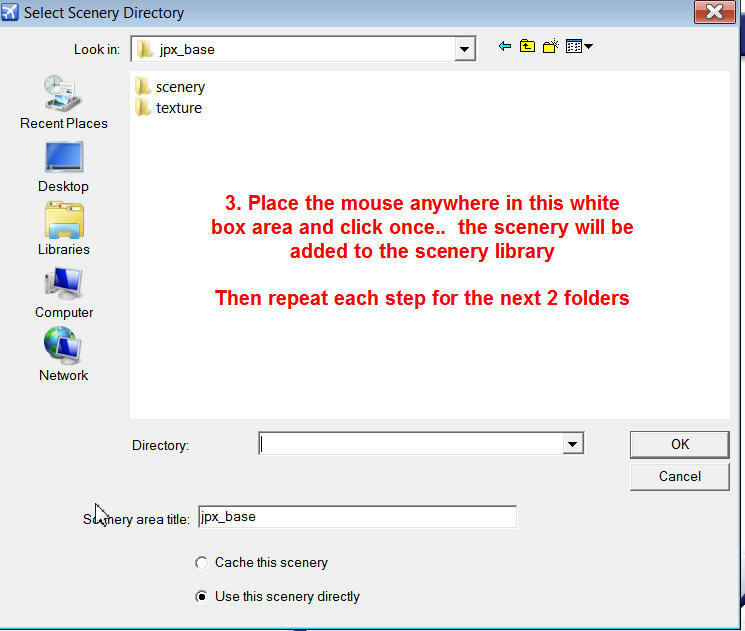 By the white box, do you mean the one labeled "scenery area title" or the one labeled "directory"? Anyway, I tried it both ways and still get the same results. Perhaps when I place d the tow GEX mod jpx files into the Haruo folder, I did not get a proper overwrite. I will try again from the beginning. This is the outline to add Scenery in Windows 7..
Hooray for Nick! That did the trick; I did not realize you meant the main white box where the scenery file was listed. It worked great and it's all fine now.. Thanks for being patient with me on this; I guess I need my head examined. Later, I will install the PW Sceneries for the Caribbean. In the replacement beach texture section, it mentions correcting the FSX terrain.cfg, but doesn't give any details. Is this important? That's good then; I have all the new GEX series so I'm good to go for PWsceneries. I would very much like to try out this Japan Landclass you describe but the link is unfortunately no longer working. Can you possibly share a copy of it with me or help me find where it may be located on his site? i am looking now but not having much luck yet. I have collected a lot of FSX resources on Japan and would love to try this set as you highly reccomend it. thanks for any help on this. "I would very much like to try out this Japan Landclass you describe but the link you posted above is unfortunately no longer working." If still available.. I have a question: Is this much better than the SceneryTech Asia. Can it be used with SceneryTech Asia? these all work as i dl them again tho i had some already just to be safe and have a backup. Work is continuing in Japan but i see some o the sites are now gone so maybe things are fading a bit in favour of that new variation of FSX. Thanks Nick. Once the link did not work... I stopped reading. LOL. Thanks for gettingthis back up for us! Thanks for the Links CrisGer! I will check them out. Much appreciated. Will this work for those upgrading to GEX ASA 1.10 ? Let me check the GEX files.. the landclass part will, no question.. its just landclass but the GEX files in the zip I posted may need to be updated, I cant remember since its been a while. I have done exactly as described, but don�t see any difference in scenery ..disabeled or enabled Japan Landclass. Can I have forgot anything.. The directions are clear. I don't know what the issue is or how to assist. Going to upgrade GEX to 1.20 and Japan. I just ran across this and installed it. The level of quality of this is top rate, amazing that it is freeware (though one has to pay for admission with GEX ASA). Tokyo at dense autogen tanks my performance, as mentioned, but does look stunning, as do all of the other areas I've visited in FSX (which don't tank FPS at all). All I can say is thanks for advertising this and providing for free such a brilliant work. Mr. Haruo, much thanks! Obviously a labor of love. It's amazing what quality landclass can do for FSX; IMO this easily outshines UTX. GEX/GEP3D is not required to use the freeware LC. If you use the GEX/GEP3D products then the patch I posted is required in order to upgrade the experience and match tiles but anyone can use the LC without GEX/GEP3D. The patch cant be used, that's all. Yes, it is one of the best LC's I have seen for a specific area. Well. GEX ASA with the patch and this Japan LC is nice. Great bonus for us with GEX ASA. Some addons like to edit FSX Autogen files. For the best experience with lots of Autogen and trees, disable Forest Performance Fix and use the original Autogen files dated 2006/2007. Tokyo is hard on FPS. Lower the settings. When I said FSX Autogen files, I mean those in the FSX\Autogen directory. Addons like FT Grenadines/29Palms Skiathos/Orbx FTX like to edit these. You cant remove the GEX autogen files.. !! GEX Autogen files ? 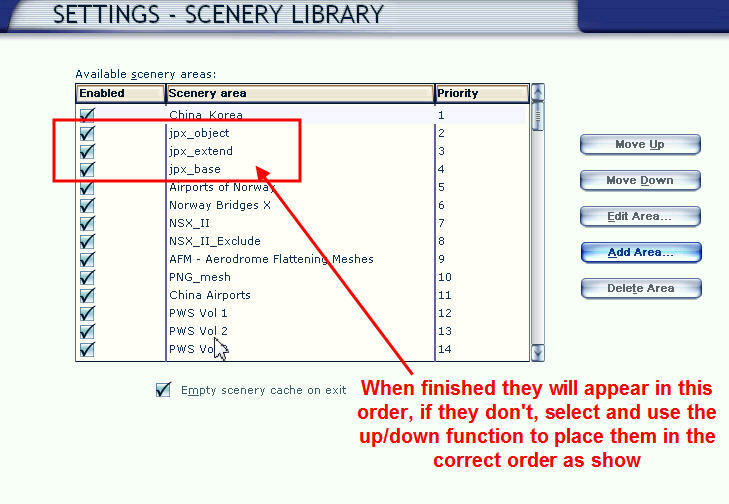 I mean those files in FSX\Autogen\ directory.